Where Else promises to be unique in Viman Nagar, a neighbourhood already brimming with so many eateries. Four young friends came together to put their love for food and travel experiences in a melting pot called ‘Where Else’. This new café and bar is the brainchild of sibling duo Ardesh and Daisy Rustomjee and best friend duo Amritha Shrikumar and Sweta Jobanputra. These Viman Nagar residents have been firsthand witnesses to the rise of new eateries in their locality. With ‘Where Else’ they aim to fill in the void of a place that offers all-day breakfast and good quality indulgent food. We drove to the outlet in its first week of opening to find out if ‘Where Else’ is the place to be. 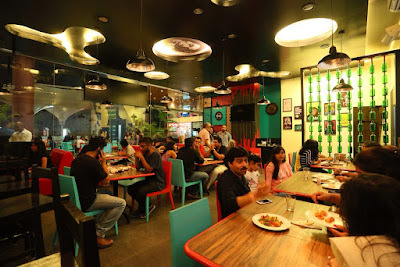 The café is located at the ground floor of a commercial complex at Viman Nagar’s busy Dutt Mandir chowk. It’s a sprawling site with an air-conditioned indoor space and an airy alfresco section made verdant with potted plants. The café is vibrant and quirky with a cool teal and bright red splashed across the furniture and walls. Old single malt bottles have been repurposed to create a ceiling-to-floor installation and rusty bed springs repurposed for lighting fixtures over the black and white bar. The hands-on partners have poured their hearts into designing a menu that tilts towards American and Continental cuisines. You can choose from an elaborate list of all-day breakfast items, munchies, sandwiches, hot dogs, burgers, grills and teas and coffees. Their love for bacon is evident. We’re ecstatic to finally tuck into not just plain ol’ Mac n Cheese but Bacon Overload Mac n Cheese (Rs 255). It’s a portion fit enough to feed a very hungry stomach; the macaroni is cooked al dente, it’s welling over with bacon bits and the flavour of the cured meat infused with white sauce is simply comforting. Their menu also offers a full plate of bacon strips (Rs 175) – a treat that bacon lovers in the city have had to wait so long for. With a fancy for the name, we ordered Magic Mushrooms (Rs 175) and six bite-sized portions of breaded stuffed mushrooms came on a swiveled dressing of mango-mayo. We’ve never tasted such diverse flavours marrying so well – the savoury cheese oozing out of fresh earthy mushrooms seasoned with black pepper was balanced well with the fruity-freshness of the mango dip. With the onset of the monsoons, we recommend the next item – Beer Cheddar Chowder (Rs 155). This soup popular in the West combines the sharpness of cheddar and beer with cream. The soup to diced chicken proportion was just perfect and the buttery undertones were un-missable. Fans of susegad will be reminded of Goa’s salty air and sandy beaches with The Goan Boy (Rs 275). Pieced Goan sausages are sautéed with capsicum, green chili, onions and tomatoes sandwiched in slice bread and grilled. Four sandwich quarters served hot with potato wafers and salad will make for a very filling snack. However, big chunks of green chili in the sandwich render this a very spicy meal. If you’re looking for a wholesome and unusual lunch, go for the Hawaiian Stewed Prawns (Rs 425) - a coconut stew delicately spiced with curry leaves and red chili oil drenching flaky white rice. The consistency of the stew is just right and you’ll enjoy munching on the chunky juicy prawns. We ended our meal with their only dessert - Rich Chocolate Mousse (Rs 85) which came cutely served in a mini glass topped with whipped cream and a mint sprig, and drizzled with chocolate flakes. The mousse is creamy, dense and has a velvety texture you’ll enjoy savoring on your palate. We certainly hope they make some indulgent additions to their dessert menu. Allow us to add that the service is spot on. You’ll never find yourself with an empty or even half-filled glass of water. They also promise to soon have a beer and wine list following which games like beer pong and chuggathon will be introduced. We might also see some alterations to their menu as they test the current one and smooth out their operations. So ask us of a place where gluttony isn’t a sin and we’ll reply ‘Where Else’ with no hesitation! This review can also be read on Burrp and an interview with the partners on The Punekar.